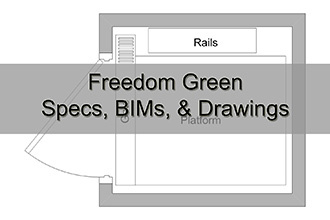 Freedom Green: The Freedom Green is a very popular home elevator. This affordable elevator has a smooth and quiet cable drive. This elevator has several options for cab finishes, gates, and doors. Freedom Elite: The Freedom Elite is a heavily upgraded version of the Freedom Green. This elevator has a larger capacity, larger cab, and sliding doors.